-In Nashua does in-studio interviews on the Woody Woodland and Jennifer Horn shows on WSMN-AM. -Holds a public meet-and-greet at the Masonic Lodge in Nashua. -Meets media for lunch at Martha’s Exchange in Nashua. -In-studio interview with Ed Naile at WLMW in Amherst. -Opens his campaign office on Elm Street in Manchester, the first announced candidate to open an office in the 2008 season. Cox also met with various radio, TV and print media during the day. -Holds a signing to promote his book "Politic$, Inc." at the Barnes & Noble bookstore in Nashua. -Tapes an in-studio interview with Karen Testerman at WKXL in Concord. 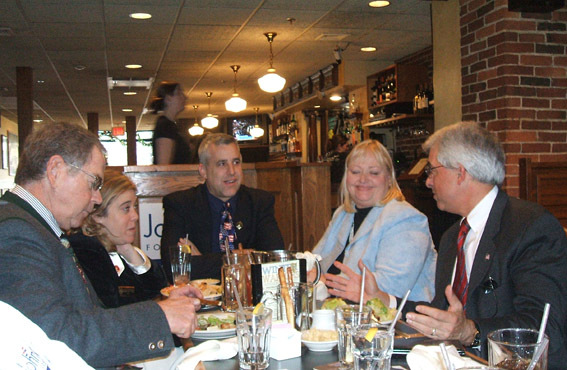 -Attends a "business meeting with John Cox," sponsored and hosted by local businessman Dale Coperanis at Cafe 324 in Manchester. -Attends a "Living Room Meeting" at the home of Hooksett Town Councilor Michael DiBitetto. -Attends a Veteran's Day memorial dedication at the Holy Rosary Church in Hooksett. -Visits the historic Robie's Country Store in Hooksett. -In Manchester goes door to door canvassing a neighborhood in Ward 9 (near the airport) for local candidates. -Spends about three hours at Hooksett Old Home Day. -Attends the Giant Pumpkin Festival in Milford. -Featured speaker at the Greater Manchester Young Republicans' fundraiser at Richard's Bistro in Manchester. -Speaks to College Republicans at Dartmouth College in Hanover. -Greets business owners in downtown Manchester. -Tapes an in-studio interview with host Karen Testerman on WDER-AM, Derry. -Tapes an interview with host Bob Barry on MCAM-TV, Manchester. -Signs a pledge to support the NH primary at City Hall in Manchester with Mayor Frank Guinta, Manchester city GOP chair Jerry Thibodeau and GOP candidate for governor Jim Coburn. -Holds a breakfast at the Merrimack Restaurant in Manchester. -Meets with the Granite State Referral Network at the 324 Café in Manchester. -Greets business owners in downtown Goffstown. -Holds a town hall-style meeting at the Village Eatery in Goffstown. -Conducts a live, in-studio interview with Terri Dudley of WTSL-AM radio, Lebanon; taped an in-studio interview with Tony Schinella of WTSL-AM radio. -Greets business owners in downtown Concord. -Tapes a segment for GTV Goffstown Television. -Speaks at a candidates' night forum [at Pelham Elementary School?] in Pelham sponsored by the Pelham Young Republicans PAC. -Greets NH residents at the 2006 Northeast Exotic Car Show [at Anheuser-Busch?] in Merrimack. July 1 visits Keene, Newport and Lebanon. July 2 visits Dixville, Berlin and Plymouth. July 3 visits Laconia and Portsmouth. July 4 visits Wolfeboro, Rochester and Manchester. -Attends the Manchester Republican Committee's Republican Lincoln/Reagan Banquet at The Courtyard in Manchester. -Holds a town hall meeting at The Yard Restaurant in Manchester. -Visits the State Republican headquarters and the Capitol in Concord. -Holds a town hall meeting at The Barn Restaurant in Dover. -Holds town hall meeting in Portsmouth. -Holds a town hall meeting in Hampton. -Attends a Republican women's meeting in Stratham. Attends the NH GOP annual meeting at Souhegan Boys & Girls Club in Milford. - On January 3, Cox visited Nashua, where he held in-studio interviews on the Woody Woodland and Jennifer Horn shows on WSMN-AM; held a public meet-and-greet at the Masonic Lodge; and met media for lunch at Martha’s Exchange. Proceeding to Amherst, he held an in-studio interview with Ed Naile at WLMW. In Manchester he then opened his campaign office on Elm Street, the first announced candidate to open an office in the 2008 season. Cox met with radio, TV and print media during the day. - On January 4, Cox held a signing to promote his book "Politic$, Inc." at the Barnes & Noble bookstore in Nashua. In Concord, he taped an in-studio interview with Karen Testerman at WKXL and hosted a legislative luncheon for state representatives and senators at the Barley House. - On August 23, Cox greeted business owners in downtown Manchester; taped an in-studio interview with host Karen Testerman on WDER-AM, Derry; taped an interview with host Bob Barry on MCAM-TV, Manchester; signed a pledge to support the NH primary at City Hall in Manchester with Mayor Frank Guinta, Manchester city GOP chair Jerry Thibodeau and GOP candidate for governor Jim Coburn. - On August 24, he held a breakfast at the Merrimack Restaurant in Manchester; addressed the Granite State Referral Network at the 324 Café in Manchester; greeted business owners in downtown Goffstown; held a town hall-style meeting at the Village Eatery in Goffstown. - On August 25, he conducted an in-studio interview with Terri Dudley at WTSL-AM radio, Lebanon; taped an in-studio interview with Tony Schinella of WTSL-AM in Concord; greeted business owners in downtown Concord; taped a segment for GTV Goffstown Television; spoke at a candidates' night forum in Pelham sponsored by the Pelham Young Republicans PAC. - On August 26, he greeted NH residents at the 2006 Northeast Exotic Car Show in Merrimack.